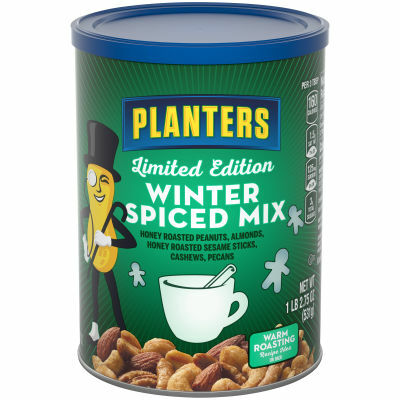 Planters Winter Spiced Mix - Planters Limited Edition Winter Spiced Mix is ideal for wholesome snacking. This scrumptious mix includes honey roasted peanuts, almonds, honey roasted sesame sticks, cashews and pecans. Your taste buds will be tantalized with this perfect balance of nuts, spices, salt and honey. Warm Up to Winter - This limited edition spiced nut mixture is made with premium quality nuts that have been honey roasted to perfection. The fragrant spices further enhance the sweet and spicy flavors and irresistibly crunchy texture. Serving size 3 Tbsp (27g).